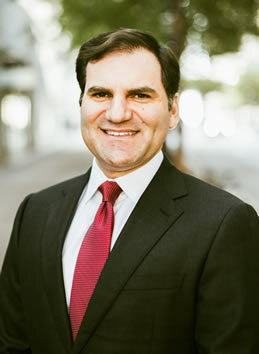 Mike Caplan, a founding partner of Caplan Cobb, serves as trial and appellate counsel in complex business disputes, constitutional cases, and class actions. Mike’s work has been the subject of news coverage in the New York Times, the Atlanta Journal-Constitution, and the Fulton County Daily Report. Mike has been selected among the “Legal Elite in Business Law” by Georgia Trend Magazine, and Martindale-Hubbell has honored Mike with its highest rating of AV Preeminent for his legal ability and professional ethics. Prior to founding Caplan Cobb, Mike served as a law clerk to the Honorable Richard W. Story in the U.S. District Court for the Northern District of Georgia and practiced at Bondurant, Mixson & Elmore. Mike and his wife, Anna, live in Decatur with their three children. "He is the quickest study I have ever seen. In court, in discovery, in negotiations, in strategy – with ear, eye, pen and that deep voice of his in tow. He approaches law like an old war horse. When he has to be bad-cop, look out, but when he plays the good-cop he’ll serve up some Southern charm. And when all are settled on a chosen path in litigation, Mike posits a new route that takes us farther." Business Litigation. Mike serves as lead counsel to Fortune 100 companies, closely-held business, directors, corporate officers, entrepreneurs, and investors. Mike’s experience spans a broad array of complex business litigation. He has recovered over $150 million on behalf of business plaintiffs in antitrust, contract, fiduciary-duty, trade secret, and RICO actions. Mike has also successfully defended companies in SEC, FTC, and CFPB investigations, business tort cases, and class actions involving substantial exposure. A skilled advocate with a strong background in business, Mike has an M.B.A. and R.I.A. designation in addition to his law degree. Mike also represents state and local governments in connection with certain business litigation matters. Mike currently acts as a Special Assistant Attorney General to the State of Georgia. Class Actions. Mike prosecutes and defends class actions involving antitrust, employment benefits, telecommunications, and securities fraud. Prior to founding Caplan Cobb, Mike served on the team that recovered $112.25 million on behalf of a nationwide class of insulation contractors alleging price-fixing in the sale of residential insulation. Mike also defends publicly-traded companies against class allegations of breach of contract, business torts, and violations of ERISA. Constitutional and Public Interest Litigation. Mike has also been recognized for his work vindicating the public interest. In 2015, Mike and his co-counsel successfully obtained the release of Justin Chapman, who was wrongfully convicted of murder and incarcerated for over 8 years. The case was the subject of the AJC’s seven-part podcast series, Breakdown. In 2012, Mike was honored with the Southern Center for Human Rights’ inaugural Gideon’s Promise Award for achieving significant reforms to Georgia’s indigent defense system. Mediation. Mike is a licensed mediator. Given the diversity of Mike’s experience and penchant for solving complex business problems, Mike is uniquely situated to serve as a mediator in high-stakes and challenging civil matters. Successfully defended the Albany-Dougherty County Hospital Authority against FTC antitrust challenge of merger of Phoebe Putney and Palmyra hospitals. The case was the subject of a ground-breaking decision on state action immunity in the United States Supreme Court. See FTC v. Phoebe Putney Health System, Inc., 133 S. Ct. 1003 (2013). Recovered $112.25 million in price-fixing conspiracy case brought in federal court in Atlanta, one of the highest antitrust settlements to date in the State of Georgia. Representing the City of Atlanta in a case brought under the Georgia Taxpayer Protection False Claims Act alleging a price-fixing and bid-rigging conspiracy in the sale of water treatment chemicals. Representing Georgia Board of Dentistry as appointed Special Assistant Attorney General in action brought under the Sherman Act. Secured a multi-million-dollar settlement on behalf of a private equity firm in a business torts and UFTA case. Obtained a seven-figure settlement on behalf of a telecommunications company in breach-of-contract case. Negotiated favorable exit packages on behalf of numerous CEOs and other company officers, including CEO of publicly-traded real estate company, CEO of privately-held oil and gas company, CEO of privately-held software company, and CEO of medical device company. Won a dispute involving a non-compete agreement on behalf of a medical provider. Along with Venable LLP, obtained complete defense victory on behalf of publicly traded payments processing company in action brought by Consumer Financial Protection Bureau. Successfully defended various officers, directors, and others in civil investigations brought by various federal government entities, including the Securities & Exchange Commission, Department of Justice, and Consumer Financial Protection Bureau. Obtained a complete dismissal of a defamation action on behalf of a journalist and local television station. Represent a local newspaper in connection with enforcement of rights under the Open Records Act. Advised concessionaire in connection with potential bid protest relating to Atlanta Airport procurement. Won favorable jury verdict in a high-stakes commercial lease dispute filed against a national telecommunications company. Negotiated favorable, six-figure lease buyout on behalf of commercial landlord. Obtained favorable resolution for hotel developer in dispute with licensor. Won multi-million-dollar settlement on behalf of American manufacturer in case brought under the Hague Convention against Chinese manufacturer for misappropriation of confidential trade information. Defending multi-national energy company in federal case alleging misappropriation of trade secrets and breach of confidentiality agreement. Defending chemical distribution company in Cobb Superior Court case alleging breach of fiduciary duty and violations of Georgia Computer Systems Protection Act. Representing a former CEO of a Fortune 1000 company, achieved a favorable confidential settlement in a dispute arising out of stock-option grants. Won certification and recovered $112.25 million in an antitrust class action on behalf of nationwide class of insulation contractors. Won class certification and comprehensive, statewide reform of the Georgia indigent defense system, along with a fully compensatory award of fees and costs. Currently representing plaintiffs in class actions involving retirement benefits, telecommunications, and securities fraud. Secured a favorable pre-discovery resolution on behalf of a publicly-traded consulting firmin a class action alleging fraud and economic damages arising out of the provision of medical services. Defending a publicly-traded insurance company in ERISA class action involving the provision of life insurance benefits. Representing a class of indigent defendants, Mike Caplan and attorneys from the Southern Center of Human Rights achieved a comprehensive systemic reform of Georgia’s system for providing appellate indigent defense. Along with Children’s Rights, Inc. and Bondurant Mixson & Elmore, represented a class of foster children in monitoring and enforcing the terms of a class action resulting in comprehensive reform to Georgia’s child welfare system. Recovered $3.25 million in Clayton County State Court action involving injury at Atlanta Airport. Recovered maximum insurance limits in personal injury action involving bus accident. Mike has served as issues and appellate counsel in a number of high-stakes personal injury and wrongful death cases. Representing City of Atlanta in referred Georgia Taxpayer Protection False Claims Act involving allegations of price fixing and bid rigging. Representing a relator in an under-seal FCA case involving alleged kickbacks. Representing a public employee, secured a six-figure settlement in a Georgia Whistleblower Act case. Along with Bobby Lee Cook, Mike successfully defended a state court judge in an election fraud case involving a constitutional challenge to state election laws. On appeal of a federal conviction, Mike persuaded the Eleventh Circuit that the district court erred in admitting prior acts evidence. United States v. Walter Sanders, Jr., 668 F.3d 1298 (11th Cir. 2012).